Romeo & Juliet meets One Flew Over the Cuckoo's Nest! A love story set in a mental hospital - what more can I say? "Mindy Mejia's latest is riveting." "Mejia's thrilling tale works both as an engaging mystery and a haunting meditation on grief, abandonment, and the lost places within ourselves. Brutal, devastating, and utterly riveting." "The author uses Lake Superior's violent storms and the Boundary Waters' forbidding wilderness to intensify the story's emotional impact and heighten its exploration into the unpredictability of half-buried secrets." "Atmospheric . . . arresting." "Mejia’s writing crosses back and forth between exquisite literary descriptions and thrilleresque escapes and acts of violence." 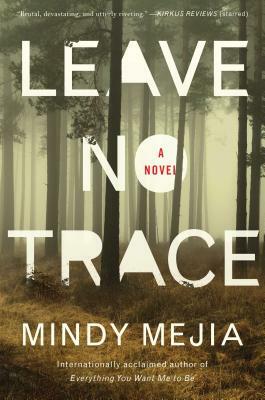 "Mindy Mejia’s LEAVE NO TRACE leaves the reader breathless: Daring characters, a suspenseful story you will tear through, and the ticking clock of an approaching dark, cold Minnesota winter. Riveting." "Riveting and beautifully rendered, LEAVE NO TRACE hooks you from the first page and never lets go. A must-read thriller." "This psychological thriller is a triumph." "If you couldn't tear yourself away from Everything You Want Me to Be, you definitely need to pick up this new book by Mindy Mejia." "An exciting mystery that keeps you turning the pages to find out more. Must read!" "Mindy Mejia kicks things up a notch, delivering another nail-biting page-turner that grabs you early and never lets go." "Excellent . . . A strong sense of place infuses LEAVE NO TRACE, especially the expansive Boundary Waters--a place of wild beauty." "Leave No Trace is a masterful gem with that rare combination of provocative and magical descriptions, compelling characters, and a breathtaking, heart-pounding plot. A powerful journey exploring the fluidity of sanity, the pain of depression, and the healing properties of the natural world. I haven't been this transported by a journey in the woods since reading Cheryl Strayed's Wild. This story will linger with readers long after the last page is turned." "This psychological mystery explores the impact of a life lived in true isolation." "Mejia wows again with wonderful words, great character development, and a beautiful homage to the Boundary Waters." "Leave No Trace is an entertaining book that also alters one’s world view just a bit in the end." "An insightful look into mental health issues, a media frenzy and life in the wild."